It’s funny thinking back to just weeks after my son was born. During my pregnancy I broke out very badly. No healthy glowing skin for this mama. Instead my face was often covered in acne some of it cystic. I planned to start Proactiv once I had my son. My husband had ordered it for me so this way I could start the regimen immediately after. So there we were sitting in the pediatrician’s office and she walked in and saw my red face and asked ‘Why is your skin so red? Do you have rosacea?’ I squinted and said that I was starting a new acne treatment to treat the hormonal acne. I left the office feeling so angry. Who even points that stuff out? I eventually shrugged it off. Clearly it was a reaction to my new skin care regimen. The redness will subside. And it did. Throughout the years I’ve dealt with some redness flare-ups. I had discussed it with my doctors, but they always shrugged it off. I figured if they weren’t worried why should I be? Maybe I just had really sensitive skin? When I finally had the skin I always wanted you’d think I would have stopped there. Nope. I let people convince me I needed all of the fancy exfoliating tools and was promised if I exfoliated often my skin would thank me for it. Before I knew it my redness was accompanied by a bunch of tiny white bumps. Looking back on some reviews I even mentioned how my skin would freak out whenever I used certain products. Mainly sheet masks. 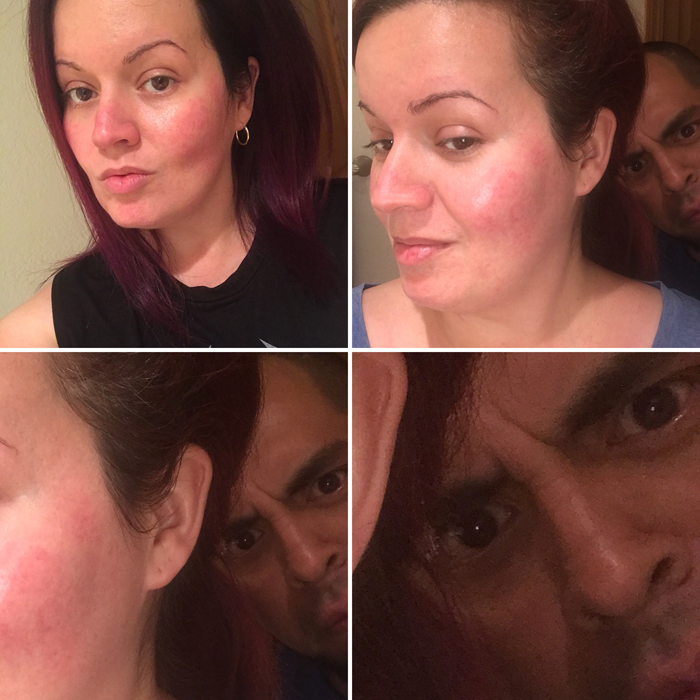 Turns out exfoliating is very very bad for those of us with rosacea. My dermatologist actually got very angry and walked away from me just after she told me to stop with the exfoliating, scrubs, and peels. I was finally diagnosed just last week. I still don’t have a full understanding of rosacea. It turns out I paid my dermatologist my hard earned money just for her to throw a sheet of paper my way and storm off. How do I know what’s causing my flare-ups? How can I fix this? I turned to Google. I personally haven’t noticed if any skin care or makeup products are triggers. My face/chest will get red whether I am bare-faced or wearing a full face of makeup. It really doesn’t matter. Exfoliating does worsen things. With the exception of some products. I will list them at a later time. So how do I go about fixing this? Well, turns out some people have had success with antibiotics and/or topicals. Others not so much. I dug deeper. Then I found that even more people had success with diet and lifestyle change. Before seeing my dermatologist I had already started working on changing my diet. Obviously I haven’t been strict and often end up at the coffee shop and Panera. That will have to change. As much as I love my coffee and flatbreads, I love my skin more. I don’t think coffee is a trigger for me, but the lattes might be. Rather than doing what I usually do which is make things super complicated for myself, I’m going to take it easy and eliminate the known triggers. I’m confident that eliminating those triggers along with being more gentle with my skin that I will see some changes. I know the redness will always be an issue. Especially since it always has been. So there you have it. I have once again considered closing Midwest Glam because who is going to want to see looks done on a red bumpy face? But you know what? I started this blog because I love sharing my newest makeup/skin care/hair care finds. I love creating looks even if I’m the only one digging them. I love sharing shiny new things I purchase whether I got it at a super good deal or not. I love sharing the occasional recipe. I love sharing some of my photography. But most of all I love connecting with other people who share these same interests. I’m not going to hide who I am. Just know that when you see photos of me now they may look different. Redness is difficult to even out as it is. But texture is even harder to work with. These past few years I have been suffering with this condition and you’d never know it because I photographed myself on my ‘good’ days. Who doesn’t want to be seen at their best? But these days if you were to see me in person, you’d be looking at a completely different face. I’m just trying to keep it real with y’all. Here are some photos I snapped with my iPone just before I started my job. This is my skin on ‘good’ days. As you can see it’s a bit red and blotchy, but there’s no texture. There’s even a bit of a healthyish glow going on. I included the close-ups of my husband in the background because it made me laugh. Anyway, I’d give anything to get my skin back to that state. But if I can, I’d like to even it out even more. Right now that is my goal. Despite the stress that this whole thing is causing me along with starting a new job and driving regularly, I’m determined to get this under control. I’ve joined several support groups on Facebook and have written down a bunch of products to try. 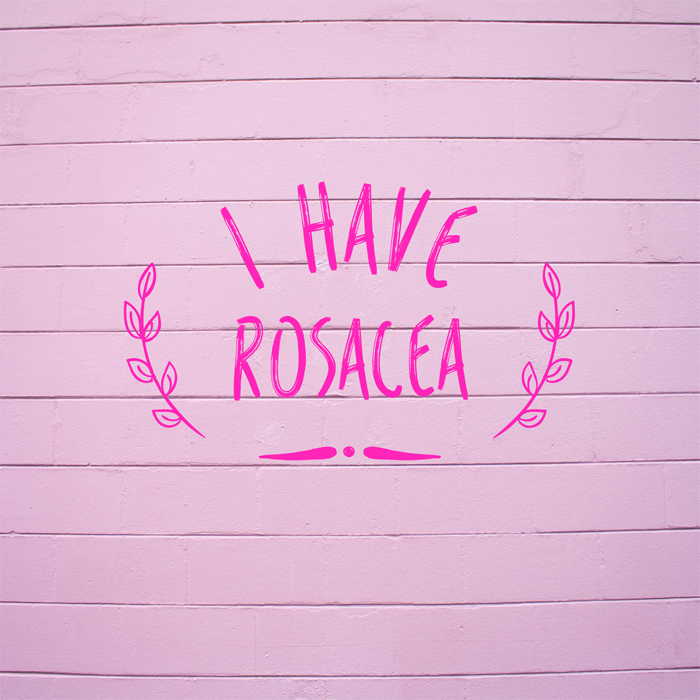 I’m going to make a category for rosacea. I’ll try to post under there often. Whenever I find something that works or doesn’t I’ll be sure to share it with you all. I’m not a professional nor do I even fully understand what is going on with my skin right now. I also know that everyone’s skin is different. What works for me might not work for you. But if I can help someone that would be pretty amazing. Rosacea is very frustrating. I constantly wonder why? How? I suppose I can’t dwell on the whys and the hows. So instead I’m going to focus on healing. And maybe learn to love the skin I’m in. Redness, itchy bumps and all.